1. Three GPS sites in the Transantarctic Mountain deformation Network (TAMDEF) were upgraded for year-round operation with telemetry and daily data retrieval by the UNAVCO archive (Fig. 1). This effort included power system upgrades, the installation of a radio repeater on Mt. Erebus, and Iridium satellite data retrieval from the most remote site at Fishtail Point. 2. The installation of a GPS testbed site at McMurdo Station for the purpose of field testing components before deployment to more remote location, and for testing higher risk new products and configurations in the Antarctic environment without jeopardizing science data. 3. 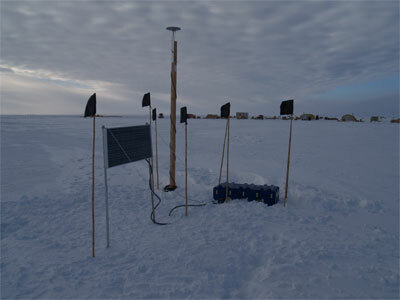 The installation of a new monument and receiver at the South Pole, site AMU2. GPS site AMUN at the Amundsen Scott South Pole Station was decommissioned this year as operations were moved to the new South Pole Station, and a hew receiver and monument were established as the first science instrumentation in the station science laboratory. A tie was made with the old station AMUN, and the true geographic pole was resurveyed and positioned due to ice motion (Fig. 2). Operation of this site is provided jointly by UNAVCO and the USGS (Larry Hothem). 4. Installation of a UNAVCO operated base station at the West Antarctic Ice Sheet (WAIS) Divide drilling project site to support glaciology research during the lifespan of the camp (Fig. 3). 5. Installation of a community GPS base station at McMurdo Station. A new Trimble NetRS receiver was added to the NASA GGN site MCM4 for local access and use. This provides local users the ability to configure the receiver for applications such as high rate data collection without interfering with GGN operations. 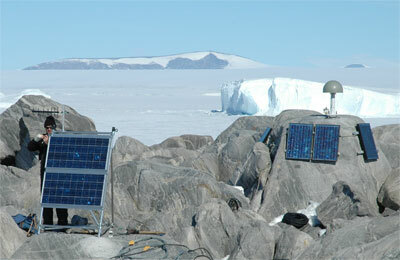 Figure 1 - Seth White adding solar panels and communications link to site ROB4 at Cape Roberts. Operation of this site is a joint effort between the Ohio State University, the USGS, UNAVCO, and Land Information New Zealand (LINZ). 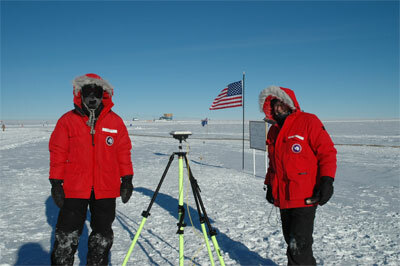 Figure 2 - Bjorn Johns (UNAVCO) and Larry Hothem (USGS) using GPS to reposition the geographic South Pole marker while enduring the -50�C temperature. Figure 3 - GPS base station at the WAIS Divide camp. The antenna is mounted high due to ~1m per yearl snow accumulation at the site, and a wireless connection allows the receiver to be controlled and downloaded from inside the camp buildings which are moved annually.